Development awareness is important. It was a DFID scheme Platform 2 which helps increase awareness that allowed me to get a better understanding of development issues first hand. It is important that something fills the gap for awareness raising as how is the tax payer meant to understand where their money is going without the information and knowledge to do so properly. We all know that a lot of hip people are moving east these days. Well Oxfam have set up an East London Oxfam Campaigning Group in order to foster more involvement in the loving East End. 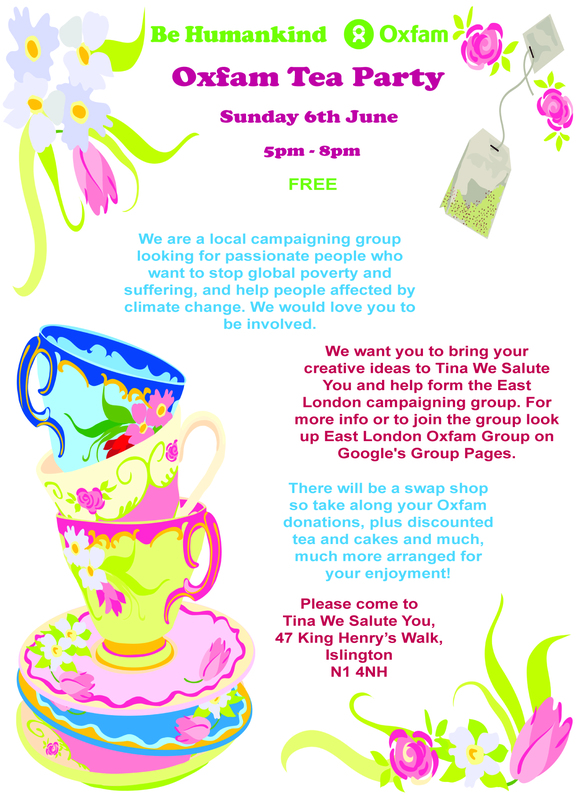 Come along to the Tea Party on the 6th of June at Tina We Salute You @ 5-8pm and have some cake and tea and soak up the fun atmosphere. See you there!!! For all you Londoners that love and want a little bit of celebrity in your life, OXFAM is giving you the chance. Selfridges and OXFAM have teamed up to create the largest charity pop-up shop. The Oxfam Curiosity Shop is a great idea, and it is only around between the 14th – 20th of May 2010. There is also an online auction with items and prizes from the likes of Beyonce, Alexa Chung to Lady Gaga. So pop down and see what you can pick up! Undergraduate, Rose Melissa Ilboudo 24, has been announced winner of the British Councils International Student Awards, Shine! 2010. The awards, were hosted in London on April 21 by BBC presenter Konnie Huq, and saw Melissa presented with her prize. Melissa was one of 1,300 students, from 120 countries who entered the prestigious awards. Her time at the University of East Anglia has seen her help raise more than £200,000 for her home country alongside Christian Aid, attend the Copenhagen Conference as a delegate for Burkina Faso, and even meet President Obama. Melissa; who is in her third year of a degree in International Development, was shortlisted for the final stage of the awards after submitting a letter to her uncle which described her time as a UEA student. When asked of the influence the award had on her, Melissa said it “highly influenced my life, I am even more determined today to continue. When something unexpected happens it makes you realise that indeed nothing is impossible”. Ben Jones, Melissa’s academic advisor spoke about her achievements and what it meant for the DEV: What struck me most about the awards ceremony was the modesty, thoughtfulness and generosity of spirit with which Melissa accepted the award. Melissa is a real credit to the school, the university and the community of international students who choose to study in the UK. Melissa is an example of an international student who has truly embraced her experience in the UK. The recognition gained through the Shine! award is well deserved and shows the importance of international students contributions within the UK. Well done and keep up the great work Mel :). The Lost Libraries of Timbuktu BBC4 documentary shows Aminatta Forna‘s journey to Timbuktu in Mali, to research the deep literature and manuscripts. 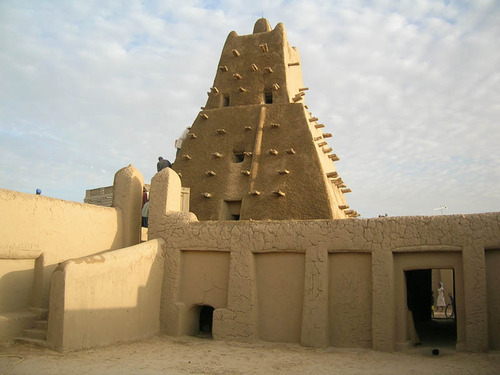 The history of Timbuktu over the centuries shows the importance of scholarship and the power of knowledge. This is not a history which is commonly known. This programme shows a side of African history which is sadly not shown through much of the mainstream media. 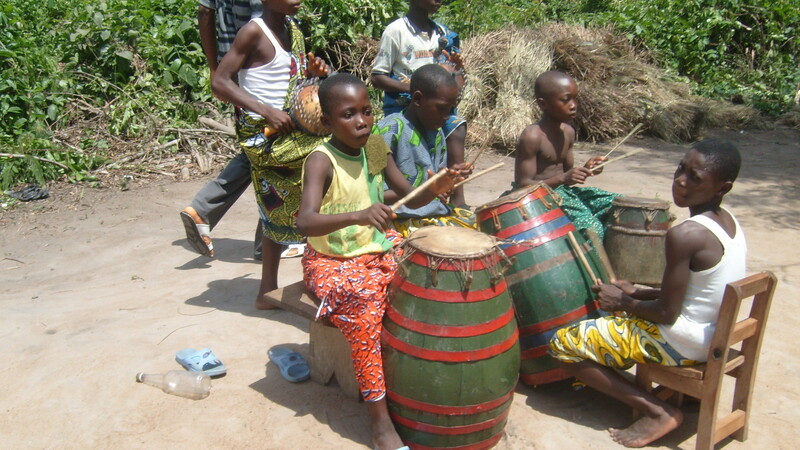 Take some time to understand the beauty of African history. All history is up for interpretation and there is only so much we can learn in school. The power to research and gain knowledge on a personal level is is up to the individual, so take the time to do so as it allows ones mind to grow.